The weeks running up to Christmas just seem to be flying by and we are busy, busy bees! 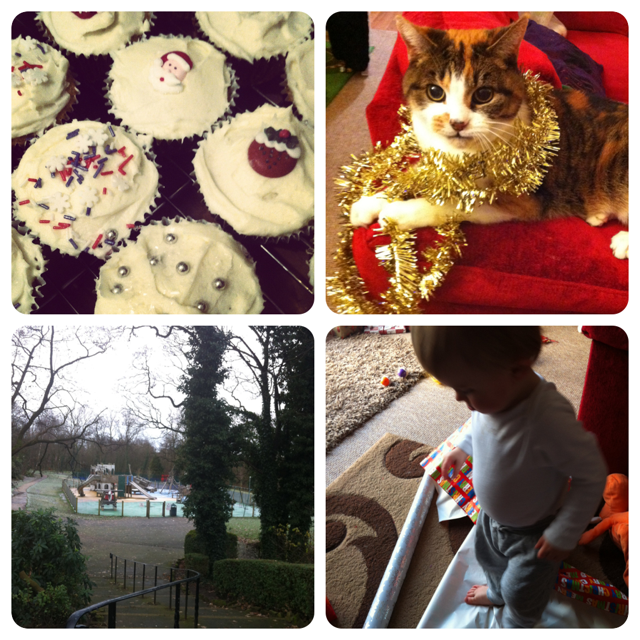 I spent the whole of Monday in the kitchen; I was baking cakes and biscuits for James’ school’s Christmas Fayre! It took me the whole day and Lucas was very pleased as he was allowed to watch much more Toy Story than usual. Tuesday morning we went to Tots and Tinies then off to Ikea for lunch and to pick up some little play kitchen bits for Father Christmas’ present. That afternoon we were off to the Christmas Fayre. James introduced Lucas to his class and he charmed them all, tottering round the classroom and grinning. He really took it in his stride and I thought a class of 10 year olds might frighten him. James’ Mum and Dad were back from their holiday late Tuesday so we had a good catch up with them on Wednesday and Lucas got some lovely gifts. Thursday morning we went out for a lovely long wintery walk, wrapped up warm of course. I like our park at this time of year; it is so peaceful I just love having some quiet time walking. Friday was spent in waiting for parcels, always seems to be the case at the moment, but I think we have done most of our Christmas shopping now and Lucas was very keen to help me with the present wrapping! On several occasions I reached for the wrapping paper only to discover a toddler wandering past, chuckling with a tube of paper held aloft. Unfortunately Daddy wasn’t very well on Saturday so we decided to give him a bit of peace and quiet and go and visit my Mum. Luckily for us she was going Christmas Tree shopping so we headed along to our local farm shop, Inglenook Farm, which was holding a lovely Christmas Market. It has been so cold that we haven’t been getting outdoors as much as I would like. Seen as we could let Lucas walk round the farm I figured he would stay warmer than in the pushchair so we spent a good few hours getting some fresh air. 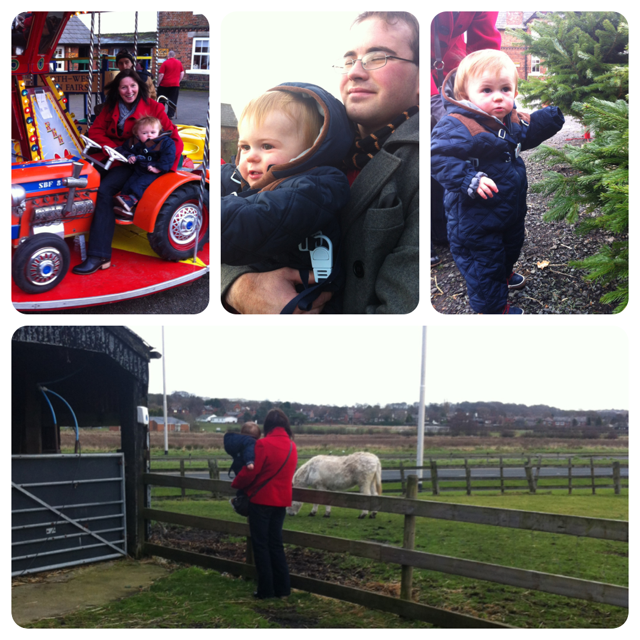 We had so much fun; he had a ride (with Nanny) on the carousel, we chatted to the sheep and the donkey with Uncle Anton, helped Nanny pick her Christmas tree, spotted Father Christmas and said hello to several doggies that we passed. He was very taken with the Donkey and started clapping his hands together when it came closer. As he is growing up I love taking him out to see new things and even when it’s a bit chilly we are still finding ways to get out, even if they are few and far between. It’s even better when we can go back to my Mums and settle down in front of her log fire; something we will be doing a lot of over Christmas. Sunday was a very lazy day, I had been out at a family 60th birthday party the night before and needed a few hours in the morning to recover! Grandma and Grandad had taken Lucas out for the morning and even in my delicate state I took to opportunity to tidy upstairs. We spent the afternoon cuddled up in our pyjamas and all three of us needed an early night ready for another busy week. That is all our adventures for this week, our week that was. As we have finally been outdoors again I’m linking this up to Coombe Mill’s Country Kids! It’s lovely that you got out with all this cold weather! It’s been freezing and icy here in Glasgow so we have not been getting out as much as we would like. He looks nice and cosy in his all in one! I love the look of your park, perfect for 20 minutes fresh air for the kids on a cold winters day. I am hoping to make a family trip of our Christmas tree buying this weekend too, our local farm shop grows them and is just round the corner so it may be a tractor and trailer job which the kids will love! Delighted you have all managed to get outside this week and have some fun, I love the cold days in the run up to Christmas, or perhaps it is the coming back inside to the warm! It makes me feel good whichever. Thank you for linking up to Country Kids. Getting Christmas trees with a tractor and trailer sounds great, I can imagine that the kids love picking them out, such a nice thing to do at this time or year. Hope you get a hot chocolate at the end of it all!